Which Cloud Professional are You? 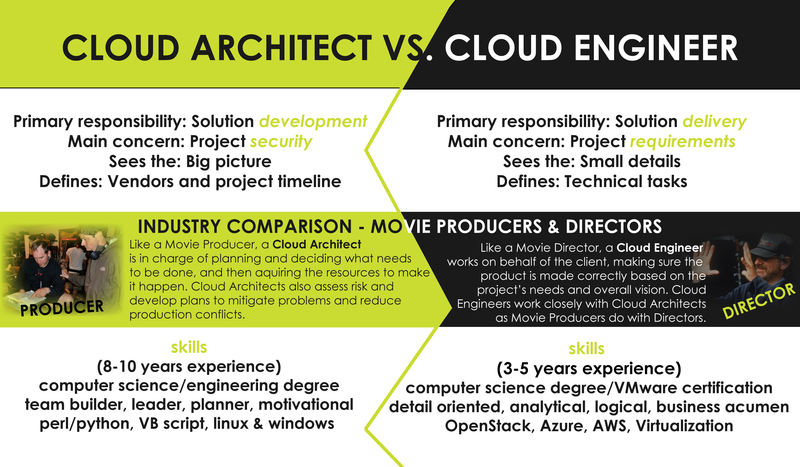 You may have seen job postings out there for Cloud Architect and Cloud Engineer, (in fact, we are currently hiring both) and not really known the difference between the two. While both share some of the same overall responsibilities in integrating cloud services, each role can be very different. If you think of it like a movie’s producer and director, the cloud architect would be the producer, while the cloud engineer would be the director. While both are making the same movie, they differ in skill and individual goals. If you need a little more information, we have broken down both roles in a handy chart below.